It will be flashback time at the Australian Open tomorrow as Novak Djokovic and Rafael Nadal line up for a reprise of the longest final in Grand Slam history. Djokovic and Nadal have faced off 52 times on the men's tour, more than any other pair of players. Oddly enough, only one of those meetings has taken place at Melbourne Park. But it was certainly a night to remember. 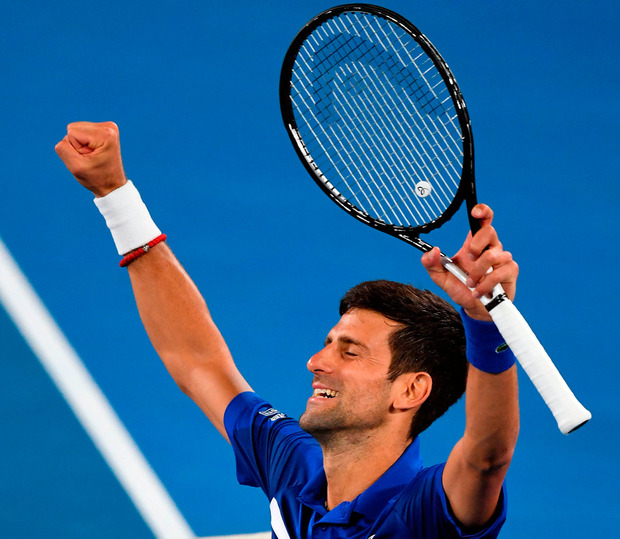 In 2012, Djokovic survived a four-hour 50-minute showdown with Andy Murray in the semi-finals, and then came back to edge a five-hour 53-minute war with Nadal. The first set of that final alone occupied 82 minutes, almost exactly the same time span that Djokovic needed to oust Lucas Pouille in a contrastingly facile victory yesterday. "I think Nadal has historically, throughout my life and career, been the greatest rival that I ever played against on all the surfaces," said Djokovic. "Some matches that we had against each other were a great turning point in my career. I feel they have made me rethink my game. "Those kind of encounters have also made me the player I am today, without a doubt. "These are the kind of matches that you live for, finals of Slams, playing the greatest rivals at their best. After sealing what was the third of his six Australian Open titles to date, Djokovic ripped his shirt off his torso and clenched his biceps in exultation. Such measures were not required last night. Much debate at this year's Australian Open has surrounded the so-called changing of the guard. But when the men's semi-finals arrived, they played out like hazing ceremonies, in which new arrivals to the battalion are forced to suffer a ritual humiliation. Stefanos Tsitsipas had become the first victim, when he endured a 106-minute humbling at the hands of Rafael Nadal on Thursday. It was Pouille's turn yesterday, and this one was even worse. Djokovic admitted that he had set out with the intention of dropping fewer than six games - which was Tsitsipas's tally in his own 6-2, 6-4, 6-0 defeat - and thus score a psychological victory over Nadal. Amazingly, he succeeded. The first point was an unplayable ace out wide, and Djokovic never slackened his intensity. By the conclusion of his 6-0, 6-2, 6-2 victory, he had racked up 24 winners and the vanishingly small total of five unforced errors. "'It's definitely one of the best matches I ever had on this court," Djokovic told Jim Courier in his on-court interview. "Everything worked the way I imagined it before the match and more so." You had to feel for Pouille, the French 24-year-old playing his first Major semi-final. He seemed to feel the pressure of an underwhelmed crowd, especially as there was only one match on last night's ticket. As Djokovic tightened the screw, he played faster and faster, but eventually came away with just 44 points, three fewer than Tsitsipas had won on Thursday. "When he's playing like this, he's the best in the world for sure," said Pouille.